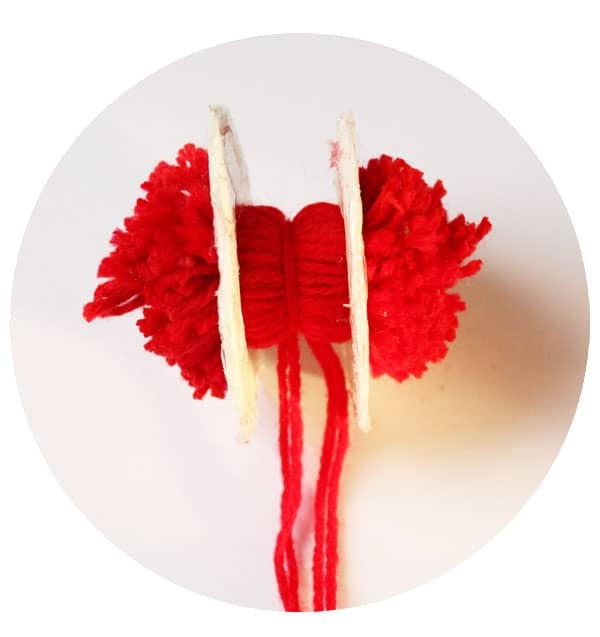 We’ve all seen a dozen tutorials on how to make a pom pom. However, most I’ve seen have you poor souls wrapping a single lonely strand of yarn for what probably seems like hours, or wrapping the yarn around your hand, which doesn’t make a very tight pom pom. There are tools out there to make it easy, but cardboard is free, and well, I like free. Today I thought I’d hop on the pom pom wagon and show you what tricks I have up my sleeve! Plus, I have a pretty awesome project on the horizon that you’ll need the footwork for! Lets get to it! First you’ll need to cut two circles from cardboard (the bigger the circle the fatter the pom pom). 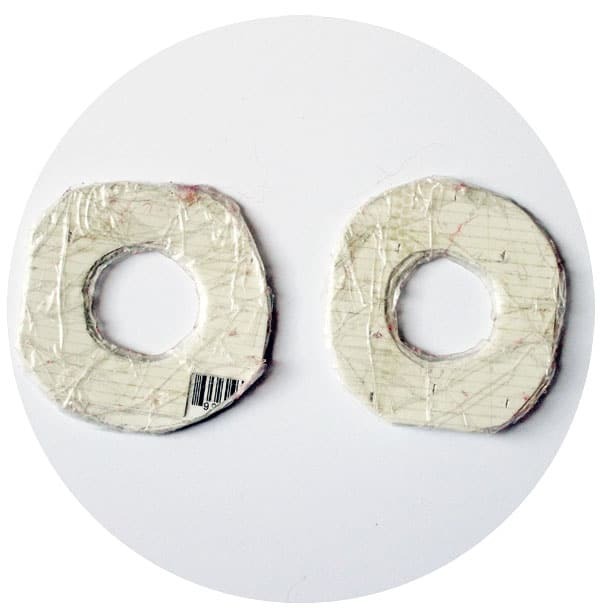 Then cover then in tape (packing, duct tape, what ever you have) this will make it so you’ll be able to reuse your circles and give them a bit more durability when you’re cutting between them. Here is a closer look (as you can see they don’t need to be perfect). The next important step is to make a 3 footish long strand of yarn and double it over so there is about 15 strands (bulky yarn will need less). Put the circles one on top of the other, and wrap your 15ish strand of yarn around (looping in through the hole) This will only take about 10 wraps. You’ll wrap one layer, and the next will lay beside the previous one until the cardboard is no longer visible. The smaller the hole in the centre when you’re done the tighter the pom pom will be. You’ll have the ends of your doubled yarn sticking out the side, but don’t worry you’ll be trimming that off! Now grab your scissors. 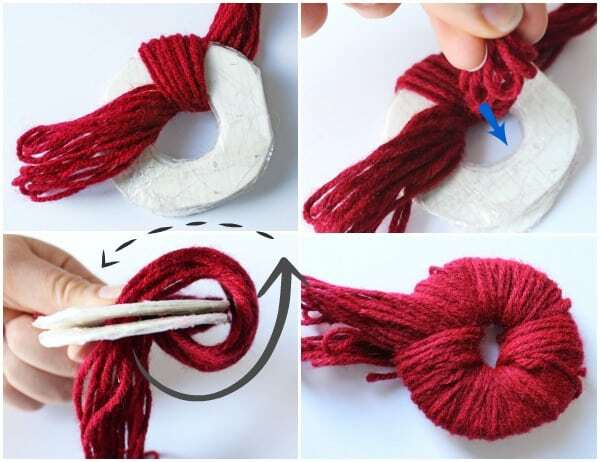 Holding your wrapped yarn circles on its side poke the scissors between the two layers of cardboard and cut in a circle. 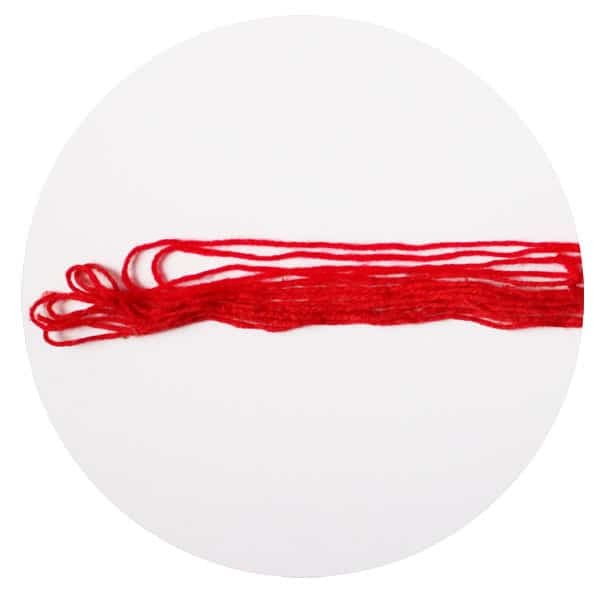 Take a 1′ strand of yarn (I like to double mine), lay between the two layers of cardboard and tie in a knot or two. Pull the cardboard off each side. Give a little trim so all the strands are the same length. That’s all there is to it! Easy right?! 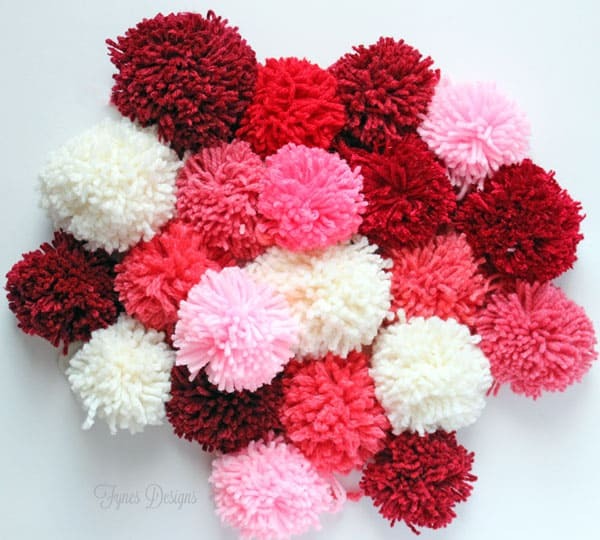 I have a great Valentines Day pom pom project in the works, so haul out your red and pink yarn scraps! This looks fantastic but as a pom-pom challenged person, can you give a little more detail (possibly in pictures) of how you wrap the yarn around the circles? Do you weave it in an S-shape through the hole from top to bottom? These look easier than the hand method I used as a kid. 🙂 Thanks! Hey Claudine, I added a few more images and text, I hope this helps with the wrapping! After you’ve gave one a try I’m sure you’ll have the hang of it! Thanks for asking, sometimes a tutorial is clear to me… but thats because I’ve done it a 1000 times! Have a great day! Great tutorial, Virginia! Your poms are so fluffy and fabulous! That’s pretty Virginia! Looking forward to the “Valentine’s Day Project” reveal! Great tutorial! It looks so easy to make!! 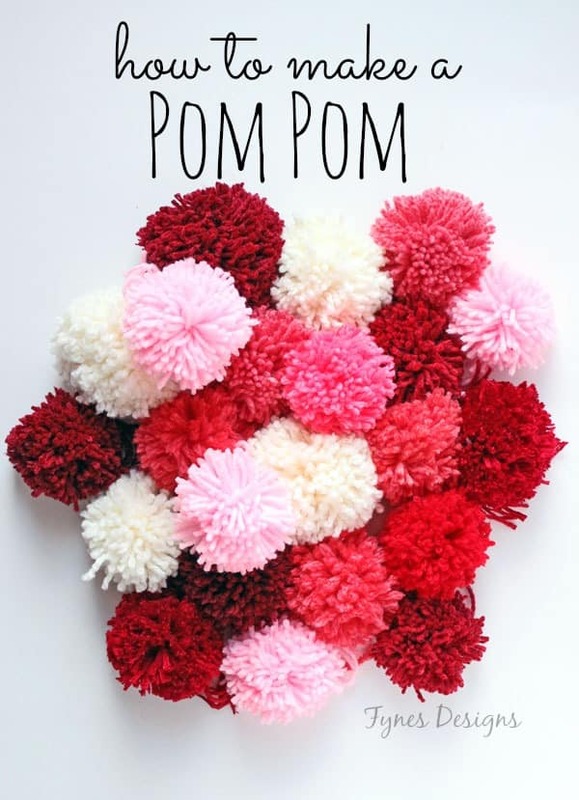 I have been looking for a simple way to make pom poms because I saw a great DIY pom pom rug I want to make! You just made this project a whole lot easier! THANK YOU! Awesome Diane! Glad its helpful, happy pom pom making! Hi! I was trying to pin your pom pom tutorial, but my computer keeps giving me an error saying ‘authorization failed’. I would love to pin it so I can use it to make your pom pom wreath…so good by the way. Is there a reason I can’t pin it? oh no!!! I’m not sure. Pinterest has been having some issues this past week. I’ll look into it. Thanks for the heads up! Hi! I love this idea but wanted an idea of how much yarn is needed for your above picture and for the wreath project you mention in a later post. I didn’t want to buy too much yarn but I don’t keep yarn scraps on hand for this project. any advice would be helpful. Thanks, Virginia! I would buy one ball of each color. Happy crafting!